How Many Historical Novels Has Jimmy Doolittle Appeared In? 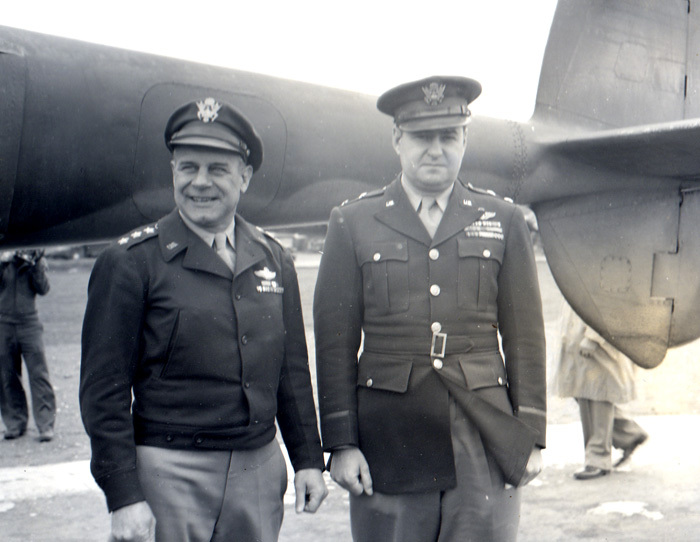 Jimmy Doolittle and another famous air general -Curtis LeMay- pose by a P-38 Lightning in England circa 1944. This year witnessed none other than Spencer Tracy portraying Doolittle in the film version of Doolittle Raider Ted Lawson’s book Thirty Seconds over Tokyo. Little did Jimmy know that the next decent dramatic depiction of him would be not in a movie, but in a pair of historical novels penned by historical novelist Jeff Shaara. Image courtesy Wikimedia. Following up my recent post about my World War Two novel in progress which will depict Jimmy Doolittle, here is a look at how many historical novels this legendary aviation pioneer and war hero appeared in. In the annals of literature, there are only two historical novels that feature features aviation pioneer and WWII hero James H. Doolittle; both are by none other than historical novelist Jeff Shaara. The first of these two is The Rising Tide. In this novel -which covers WWII in North Africa to WWII in Sicily- Jimmy is present at a meeting in Algiers, Algeria, between Dwight D. Eisenhower and Doolittle and Arthur Tedder (Doolittle was Tedder’s subordinate at this moment in time -December of 1942 as head of the U.S. Twelfth Air Force.) In the scene, Doolittle has no dialogue but chuckles at a comment made by Tedder as they leave the room. This “cameo” by Doolittle takes place on pages 203-205 of the hardcover edition. Shaara’s discussion of Doolittle’s background before North Africa is accurate, but he does not mention how Doolittle and Ike wound up getting off on the wrong foot over a minor faux pas on Jimmy’s part during a pre-Operation Torch meeting between him, Ike, and George Patton. ‘With a minimum of formality we sat down and immediately began discussing Torch. George led off with a briefing on his intentions and plans “to drive the bastards into the sea.” Ike seemed satisfied with that and turned to me. He said, “Our first job will be to acquire airfields in North Africa. As soon as they’re acquired, we’ve got to be able to operate. I saw his face change, and I knew that I had blown it. It was a dumb thing to tell a general with as much logistics experience and military service as Eisenhower. Here was a one-star reserve officer implying that a two-star general who had spent his entire adult life in the service didn’t know what he was talking about. This aside, Shaara captures Doolittle perfectly in The Rising Tide. Doolittle again appears in Shaara’s novel No Less Than Victory. Again Jimmy is at a meeting with Ike at SHAEF headquarters in Versailles, France, in November of 1944. Arthur Tedder is again present, but this time Jimmy has the floor as commander of the famous 8th Air Force. Jimmy’s “cameo” in this novel is what opens chapter 2, and occupies pages 22 to 24 of the hardcover edition. ‘My distrust of long-range weather forecasting surfaced many times during the succeeding weeks, and it came to a head again when I was giving a briefing for Tooey and Ike one day at High Wycombe. I was telling about a mission then in progress and explained that the bombers were proceeding to their secondary target. Tooey immediately interrupted to ask why. I said it was because the primary target was socked in. “But Colonel Krick assured me the primary would be clear,” Tooey said. Judging by this, Doolittle let out a cuss word every now and then when deeply irritated; but not casually, as depicted in an atrocious 2001 movie better left unnamed. Doolittle displays none of his characteristic genial warmth and humor in this sequence as well; this is accurate on Shaara’s part. Joanna Doolittle Hoppes quotes a letter from Jimmy in her biography of him in which he confesses that his Christmas message to the 8th Air Force lacked warmth. The demands of command during times of intense air operations at times would strip away Jimmy’s cheerful attitude. On a whole, Shaara depicted Doolittle well in No Less Than Victory. Apart from these two novels, however, Jimmy Doolittle rates on mentions in a scattered few others such as a novel in W.E.B. Griffin’s The Corps series entitled Battleground in which Doolittle is the boyhood hero of one of his characters. So far, only the pages of The Rising Tide and No Less Than Victory have seen him grace the pages of a historical novel as a character. Finally, Jimmy is given an honorable dramatization in T. Martin Bennett’s recently published novel Wounded Tiger, a novelization of his screenplay of the same name which depicts the parallel stories of Pearl Harbor attack commander Mitsuo Fuchida and Doolittle Raider Jake DeShazer.